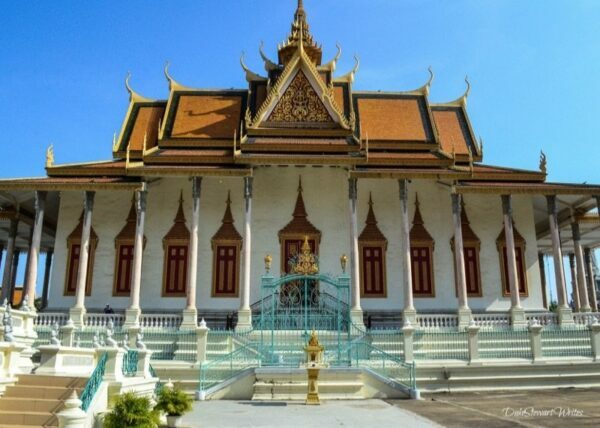 What can we learn from Visiting Phnom Penh? After spending about a week in coastal Kampot, we ride towards the bus depot in Cambodia’s capital city. I’m cautious at the thought of staying in Phnom Penh because we’re going to see some things that are difficult to process. I don’t want to come in here with insensitive eyes and an arrogant mind, because I know that we’re not immune to following Cambodia’s historical path. 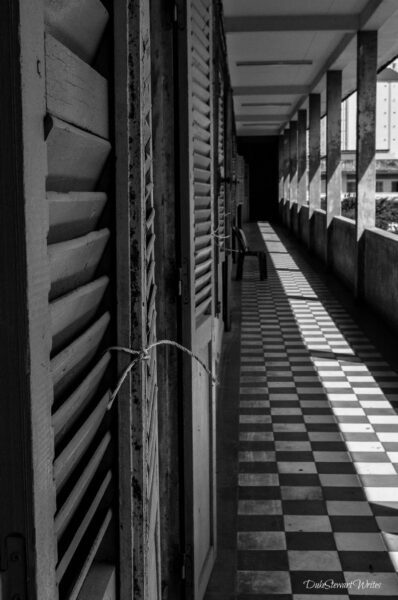 We’re visiting Phnom Penh to learn about its horrible past while looking inside to see if we’re any different. 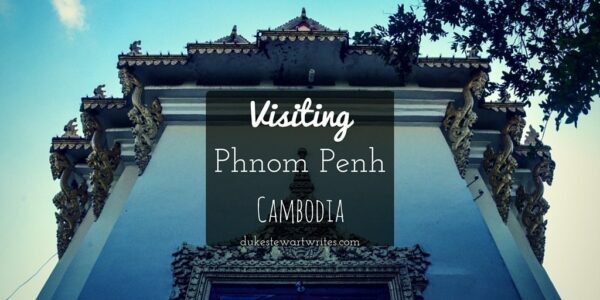 If you’re looking for more spots to fill your itinerary, we also included Phnom Penh and its surroundings among these places to visit in Cambodia! 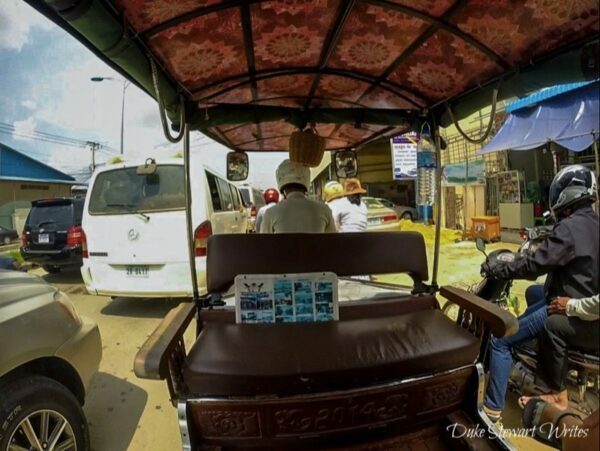 A tuk-tuk takes us through the city and the hotel I’ve booked for just the night, always waiting until we personally see the place before adding on more days. Double Leaf Boutique Hotel seems overly locked-down but once we step inside, it’s lavish and posh enough for me to think that this might be out of our league. The Russian Market (Tuol Tom Poung) isn’t far away and there’s a nice pool for cooling off after hot days here. The hotel’s staff all seems nice and even suggest booking more nights online for a better rate. We drop our bags and head out to see some men standing outside the gates. They politely ask if we need a tuk tuk, and I notice set prices by destination posted. I tell him we’d like to visit Tuol Sleng and he tries to combine it with the Killing Field as well. I appreciate the gesture but visiting both of these grim memorials in one day would be too much for us. Sticking to our guns, I explain that the former will be enough and he has us wait a minute before arriving with his ride. 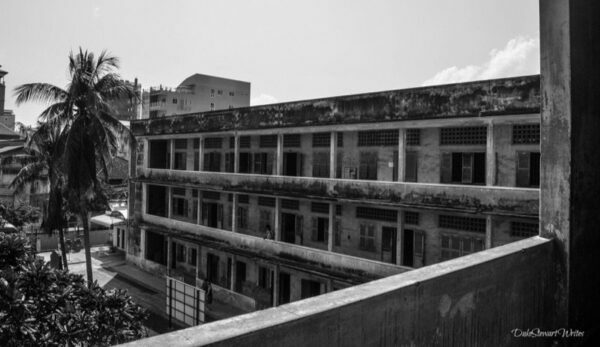 Pol Pot turned Tuol Svay Prey High School into his “secret” prison and kept it that way during the 3 years, 8 months, and 20 days that he and his murderous Khmer Rouge controlled Cambodia. It’s a short drive from the hotel and as we arrive, the former S-21 (Security Prison 21) looks very much like a school. I’d read that early afternoon is a quieter time to visit, and Christina and I arrive to a very quiet scene indeed. We have a quick look at the courtyard and walk into Building A, only to find beds without mattresses resting on dirty, bloodstained floors. Adjacent rooms house murals and didactic texts, alongside torture devices and more beds. Buildings B and C don’t make the walk any easier on this hot day, as the sweat pours down my growingly anxious forehead. B’s tiny wooden cellblocks replaced classrooms and kept prisoners between lengthy interrogation and torture sessions. The most haunting part is found in the display cases full of men, women, and even children’s faces in the form of photographs taken not long before most of them died. I look away from many of their eyes out of remorse and overwhelming sadness. It’s impossible to imagine the scenes that the Vietnamese found when they discovered this place so many years ago. We walk out and towards the exit but not before passing by one of Tuol Sleng’s few survivors (Chum Mey), who is sitting at a booth and selling his books to passersby. He was found when the Vietnamese stormed through Cambodia and stumbled upon the previously unknown S-21. I shake his hand and stand in front of him, speechless at the realization that I’ll never understand his pain and suffering. Hopefully he can live in relative peace and harmony for his remaining days. 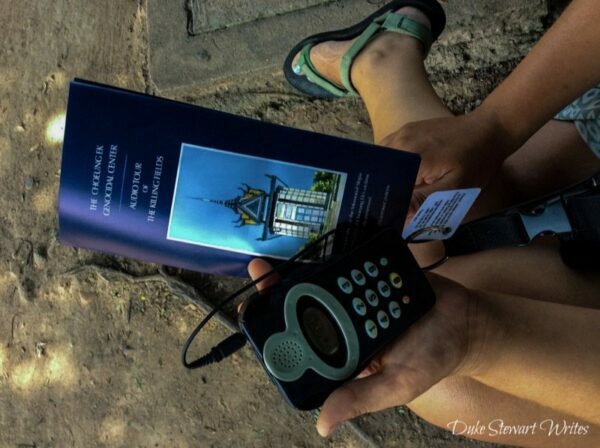 The tuk tuk takes us back for an hour or two of reflection and quiet moments to recover from Tuol Sleng. Our quiet room is a great escape from that and the afternoon heat that’s settled in for the day. The cool air conditioner quietly keeps us comfortable until I start perusing our handy and free Phnom Penh guide published by Canby, and think of a way for us to get out and into the heat again. 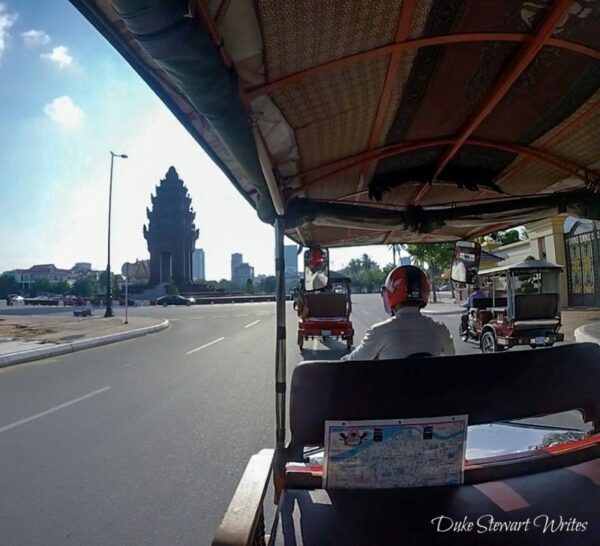 A driver takes us back through Phnom Penh’s busy streets that eventually transform into spacious, clean boulevards leading to the Royal Palace. Phnom Penh’s famed Independence Monument comes into full view, as do a slew of scooters and various street vendors. The latter are waiting on visitors near Cambodia’s testament to freedom from France in 1953. We’re let out near the Royal Palace entrance and rush towards it, trying to beat a flood of monks who’ve just gotten out of a massive tour bus. This area seems calmer and a quiet contrast to every other part of the city we’ve experienced so far. Inside the palace grounds, I’m trying to feel impressed but can’t get over the scenes that preceded our visit here. They obviously didn’t spare any expense when putting this place together, but there are people right outside who asked us for money to feed them and maybe even their families. 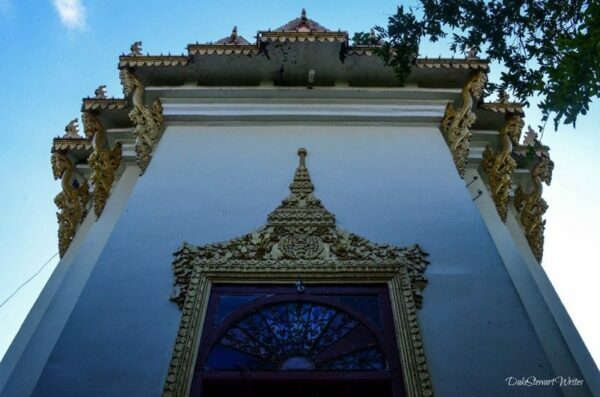 I can’t help but get angry when walking around these beautiful buildings, even the Silver Pagoda. People suffer outside while visitors swarm to the Royal Palace and pose for countless selfies in front of opportune spots. This isn’t my place to judge, and I really should keep quiet. I let it go and walk through the rest of the palace before exiting and meeting back up with our driver. The next day is our last in Phnom Penh, and we’ve decided to visit the Killing Fields of Choeung Ek. Foresight and kindness leads the tuk tuk driver to stop at a convenience store to pick up face masks for him and us before the hour-long drive. Traffic is pretty hectic and the exhaust is intense on this early morning. We arrive at the former orchard and Chinese Cemetary that now holds the grim “Killing Field” name where over 17,000 people were “smashed” into oblivion. Headphones are available in multiple languages and provide an important audio portion of the tour. 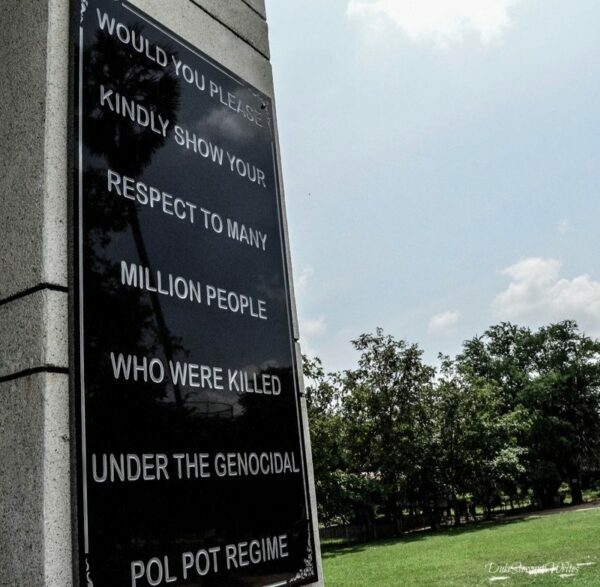 A walk through the Killing Field with closed eyes and the audio tour alone will bring tears to any visitor. I naively struggle to imagine Choeung Ek was just one of many extermination centers throughout Cambodia, and that such sites existed so close to today. The guided path takes us to stopping points where the audio tour features survivors telling their stories, either about the damage done to them or their country. I walk over pieces of clothing and can spot bone shards and teeth unearthed by recent rainfall. Those sights are troubling enough until we reach the marked mass graves and trees where children’s heads were smashed in. In lieu of using precious bullets, KR soldiers resorted to these means and used a “Magic Tree” armed with a loudspeaker to drown out the noise. 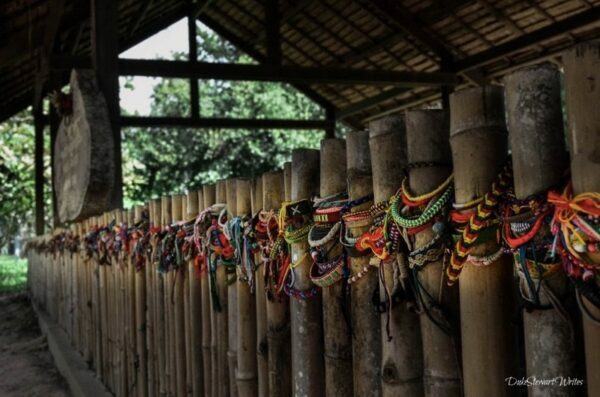 Colorful bracelets line posts along the way, especially trees where the guide details the killing children more thoroughly than before. The audio keeps playing and the victims keep talking. I stare at the tall stupa that was created as a memorial, and holds thousands of skulls collected from mass graves. It’s easy to visit a place like the Killing Fields and think that we’re better than this. Really though, the right time and circumstances could allow any leader to commit similar acts. The history and Phnom Penh’s darker side dominate the forefront but really good people are here working to make things better for everyone in Cambodia, not just those in power. Thousands of people visit Cambodia to volunteer and give something to this wonderful country, whether through teaching English or community development projects. 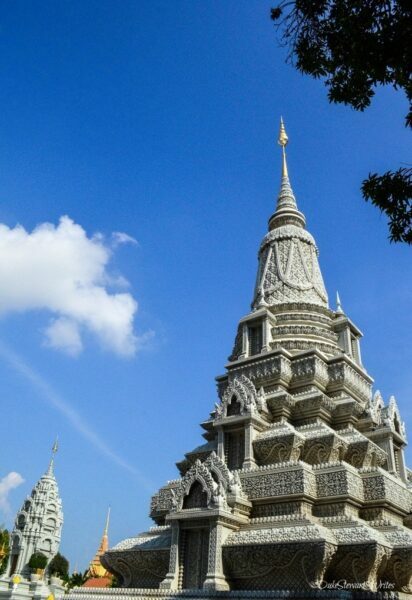 The best places to visit in Phnom Penh are ones that are working with poor, underprivileged people. 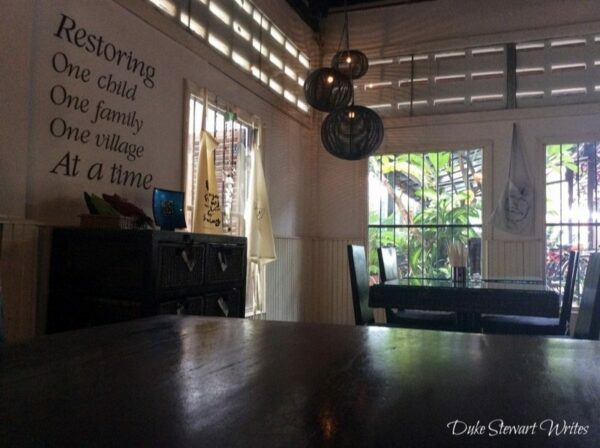 We spend one lunch enjoying delicious burgers at Restore One Café, a place that also provides training to underprivileged Cambodians who have nowhere else to turn. That’s just one example and I’m sure people can name many organizations that are helping Cambodia get back on its feet as best as possible. Even though I want to focus on the good things happening in Cambodia, I’m still troubled by our walks around the so-called Phnom Penh tourist spots. I think about what we can learn from visiting Phnom Penh. Cambodia is still recovering from terribly misguided leaders, whose paranoia and power-hunger convinced them to forge a new society through violence and mass murder. Are we any better than Cambodia? Absolutely not, because we have similar decadent symbols in our capitals and cities, with poor and underprivileged people standing in their shadows. 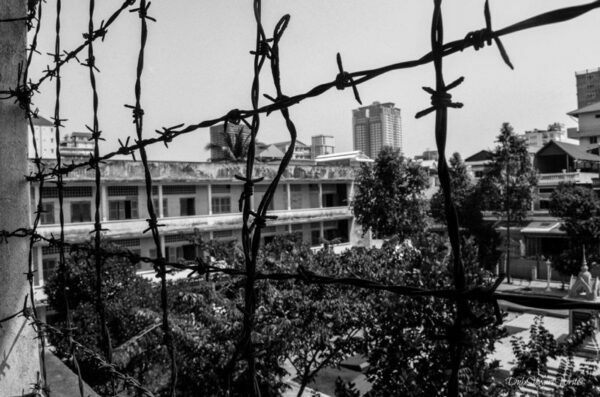 Phnom Penh isn’t the only place where genocide and not even close to the last. It’s easy to focus on the bad things that have happened in Cambodia, and that’s why the NGOs and other wonderful people hear need more than a moment in the spotlight. Not only do I visit Cambodia to explore its dark past, but to shed light on the goodness that is happening there everyday. It’s unfortunate that I couldn’t spend more time there, helping instead of just visiting Phnom Penh for a few days. 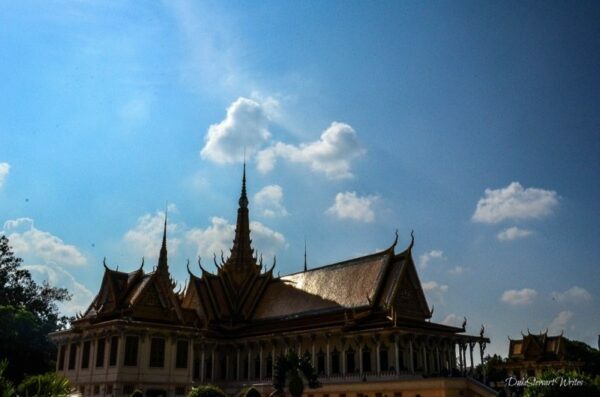 What do you think we can learn from visiting Phnom Penh? I’d love to read your thoughts in the comments section below. 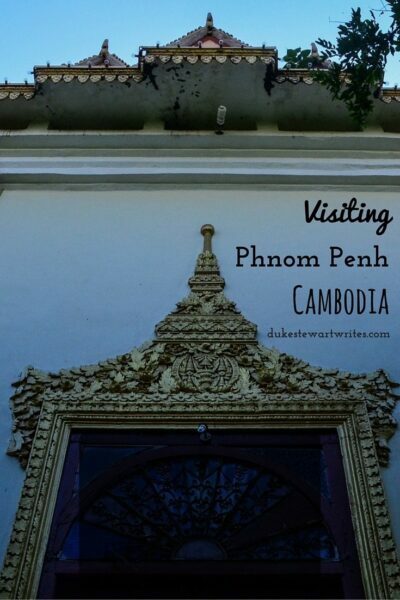 This Phnom Penh travel guide is part of our series on Cambodia Travel and Southeast Asia Travel. It was originally created on May 1, 2016. It has been maintained and updated (as of December 27, 2018) to reflect current viewpoints and travel trends. Damn, that sounds like a sobering experience. I felt just a touch of that when I encountered someone affected by Agent Orange, but it wasn’t an extended experience like yours. It’s kind of hard to justify being a tourist and being there for enjoyment when you’re faced with something that horrific, that tragic. Another fabulous article. This genuinely brought tears to my eyes. It’s refreshing to see a travel blogger tackle the ugly side of Cambodia’s history, and in such a genuine and respectful way. As you’ve said, there’s a lot we can learn from what happened in Phnom Penh. Thank you, Madison. It was tough to write this and I struggled for so long just to click “publish”. 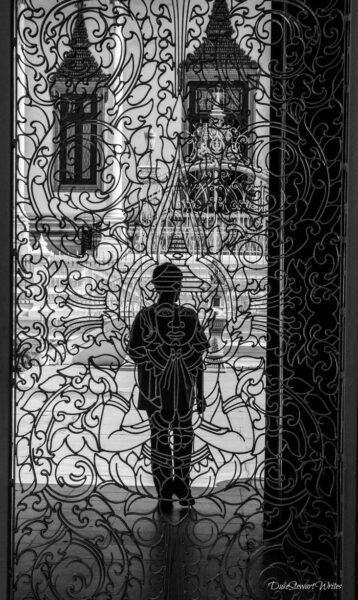 I appreciate your thoughts and can understand the emotions that just the images from Phnom Penh can bring out in a person. Take care and I hope to stay in touch.